Students often struggle with understanding energy and comprehending its crucial role in all science disciplines. This workshop will show you how to build a consistent model for energy across bio, chem, and physics. 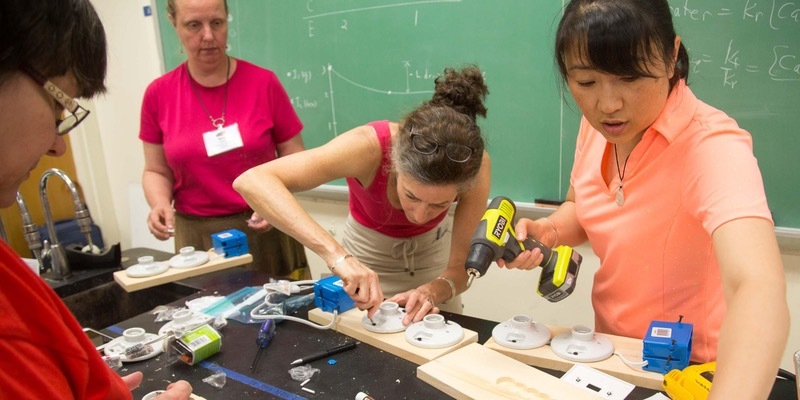 You will explore key methods to help students understand how energy, a key cross-cutting concept in the Next Generation Science Standards, can be represented by the unified idea of energy storage and transfer in the physical and biological world. We will use a simple but powerful representation tool, the Conservation of Energy (COE) diagram, to qualitatively keep track of energy in various changes. This graphical, visual approach eliminates the conflicts among the ways energy is usually taught in bio, chem, and physics, thus helping students build a deep, applicable understanding of this important concept as they study the various disciplines from 6th through 12th grade. In Part 1,we will use COE diagrams to represent energy storage and transfer in various demonstrations and scenarios in physics, building the fundamental idea of how energy storage changes when objects/particles attracted to each other are separated. We then use this idea to describe how energy is stored during observable phase changes based on particle behavior change. This paves the way for understanding energy in chemical changes and applying the same idea in biological systems, which will be addressed in Part 2 of the workshop scheduled tentatively for February 4, 2017. After attending both parts you will come away with a clear understanding of how to successfully implement some excellent visual representations to incorporate in any science course and to guide your students to the profound understanding that energy is energy; the currency for change in all of science. Energy does not change form but only the way that energy is stored in a system changes.